and here I sit here, writing a blog post rather than mosey-ing my backside down to the cave to begin my 11th year of finishing for clients. and I'm sick...so that doesn't help things. I had my flu shot (I always get them, am a believer in them). I drink Bragg's apple cider vinegar every day. I take increased vitamin C all year long. I'm very rarely sick. I'm going to let you in on a secret - I am a horrible sick person. Awful. Whiney. Grumpy. Terrible. On January 1st, I began to feel a little scratch in my throat. I drank lots of water. Then I noticed drainage. Oh no. I began to drink mugs of chicken broth ~ to no avail. I was full blown sick on Wednesday. I feel like a Mac truck has run over me. Stopped. Reversed and backed over me. Stopped. Put it in drive, then ran over me again. I'm hoping he just keeps driving and doesn't think he needs to back up again. I'm taking my meds like a good girl. Setting my watch and letting it buzz me when its time to down some Alkaseltzer Cold and Mucinex tablets. Plop Plop Fizz Fizz....guzzle, guzzle. The quilt in the copper tub was made shortly before Christmas by me :) it is a free design that is a reproduction quilt from Kathleen Tracy's Small Quilt Lovers Facebook Group. If you are interested in small quilts, I highly recommend joining Kathleen's Facebook group. She gives free patterns, lots of encouragement and monthly goals. In the remake of our kitchen dining area I went "full-on barn" theme. I've always been country, even when country wasn't cool.... (hardy har har!) But I decided to charm it up a little bit more with the "barn doors" on either side of the windows. I really like them. I used to have our Grandmother's rolling pins on either side of the windows hanging, but I put them in my big Uhl crock. I collect red handled 1950's vintage kitchen utensils....actually, I need to be honest, I started collecting them and my good friend Edgar now collects them for me and sends them to me every so often when he finds things at the sales he and Rico go to in San Francisco and the surrounding area. I find some every now and again, but my collection is in large part thanks to Edgar. I LOVE the kitchen utensils and I even use the very best ones in my own kitchen. Nothing beats a quality vintage kitchen tool! You can even see some in my white granite ware tub there on the hutch...THANK YOU EDGAR!! Everything in the tub was sent to me by Edgar :) Some of my favorite things to collect are of course the rolling pins and my next favorite are the rotary beaters. Why I don't know, but pins and beaters are my favs! This is my little red wagon from my childhood, circa 1970. 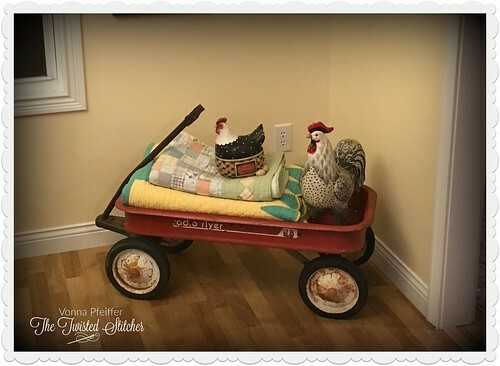 I thought it was so cute, rusty redness filled with vintage quilts and my hen and rooster. Love it! 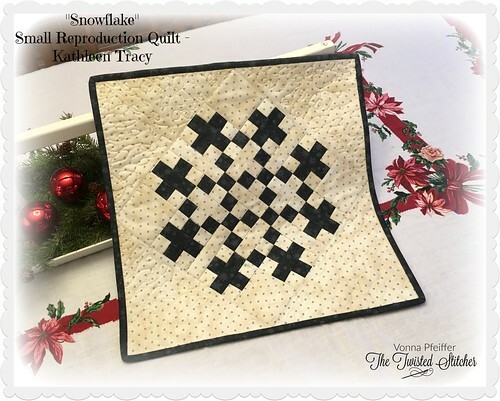 again a free pattern over on Kathleen Tracy's Small Quilt Lovers Group on Facebook. Did I tell you I got a Singer Featherweight? Well I did, last summer. I started them on Christmas Day and got them finished a couple of days later. 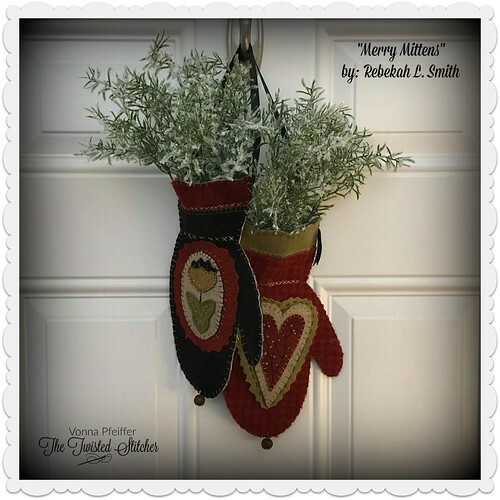 Filled them with "snowy" rosemary. Started in the spring of 1997 when I was pregnant with Katie. I am determined to get this finished this year. Math minds will figure out that this is 21 years old. Embarassing. Stitched on 28 ct evenweave. Using called for DMC. This is Marilyn Leavitt-Imblum's Told in a Garden "Song of a People". I have a thing about Amish people. Always have. Likely always will. This has a big red barn on it. Quilts! and a big ol' farm house. It will look good in my full on barn kitchen/dining area. It's on like donkey kong to get this done. Have an old Told in a Garden WIP? there you have it! All caught up on the life of The Twisted Stitcher! prayer intentions? Email me (mailbox photo, left sidebar) and I'll place your intentions in my prayer journal, let's make 2019 the most peaceful journey. Peace, flowing like a river. I am so sorry you are sick, rest rest rest! The best medicine. Thank you for sharing your home, it is beautiful. You may have inspired me to go pull my wagon upstairs...ok I'll have to carry it cause well wagons don't take stairs well. But that is such a cute display. I have been coveting featherweights, darn you darn you....you are not helping me to ignore that longing, LOL! I may also steal the mitten's idea. Remember mimicking is the best form of flattery ;) or something like that. Anyways, it means I LOVE you and you have terrific style and ideas. Please feel better soon. Sending you lots of rest and happy stitches. Oh Vonna, I am praying that your cold/flu is on the way out and you are returning to be healthy and well. I enjoyed the tour of your kitchen/dining room redo. I really like the paint color you chose along with the barn doors by the window. What fabulous treasures you have surrounded you and your family with! I look forward to see your progress on your oldest WIP. But I think you were busy with Katie and then Katie and the boys so no need to be embarrassed. The shirtings you bought with Santa money look great. I hope you have a wonderful week and don't forget to rest. Boy a lot of people have been sick. So far we've avoided it but I'm sure it will find us sometime. Hope you are better soon. Love your updated room. Beautiful. Thanks for sharing. Have a great 2019! Sorry you are under the weather. Feel better soon!!! I enjoy reading about your family, house, and endless projects (where in the world do you get all this energy to be so productive? I'm jealous!). Keep up the great work and looking forward to more great posts from you in 2019. 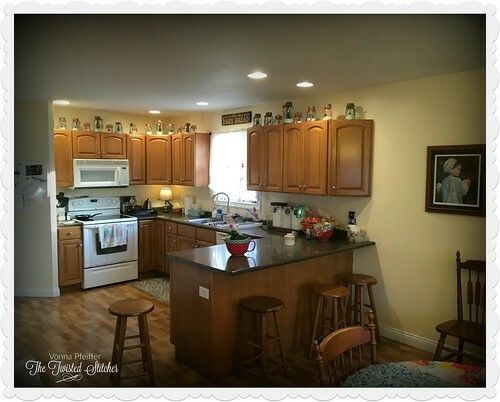 Your kitchen is so warm, cozy, welcoming, CUTE! Thanks for sharing it with us. There is a lot of "yuck" going around... take care and get well soon. So sorry to read you aren't feeling your best, Vonna! I think working with the public brings all sorts of germs your way... I always think it was amazing that I wasn't constantly sick when I worked at the library--just think of all of those germy things I was touching all day :) Love the winter decor in your home and your pretty paint color. It reminds me of the color in our front and upstairs hall. We've had it a while so I'm hoping to change it soon, though. Oh Vonna. I pray you feel better soon. 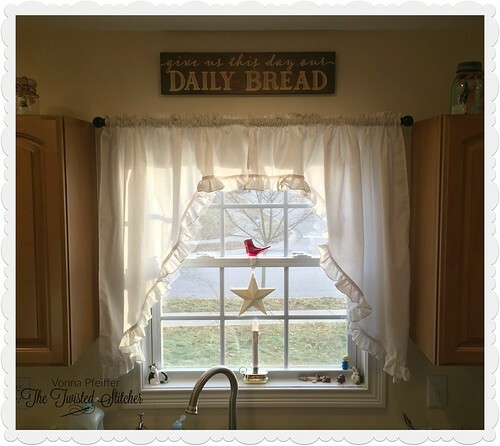 I love your wintry decoration and your kitchen is lovely and welcoming - just like you. May God bless you. I found your blog when Mary Corbett mentioned your finishing skills. I've watched all your tutorials - thank you! Just wanted to let you know how much I enjoy your blog. You come across as someone I would feel comfortable chatting and stitching with. And you provide me with inspiration to get busy stitching. Hopefully your bug will depart soon and you'll be feeling good again. Hope your feeling better soon. That cold has been a nasty, lingering one. I love, love, love the paint color!!! We moved into a 20 year old home over the summer and my antiques just don't go well with the current wall color. Will be checking it out for sure. I also have a thing for rolling pins and vintage kitchen kitsch. Our prior house was a Dutch Colonial with central brick chimney stack with double wall ovens in kitchen. I had a long peg rail with 12 of my rolling pins on it. Hubby called it my "home defense arsenal". Haven't unpacked the pins yet but I do have several crocks so will try that idea also. Thanks for the home show. I like what you do. Vonna: I am so sorry you are not feeling well, I hope the ick goes away soon real soon. Lovely home you have, thank-you for sharing with us. Told in a Garden patterns are among my favorites, although I haven't stitched any lately. I stitched a lot from the "Bookmarks" leaflet, put them in mismatched frames, and then took them all off the wall. I still intend to finish them similarly (probably just a flat finish) and put up some picture frame ledges to display them on. My short hallway on the second floor is Amish themed. Please feel better soon! I don't think many of us are good patients. Enjoyed your home tour today, Vonna. 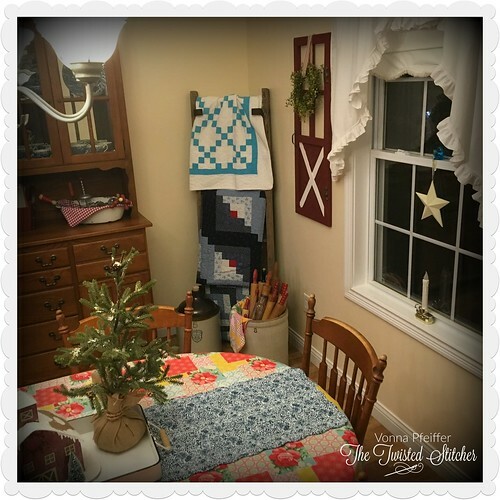 Thanks for sharing your decorating inspiration's with us and thank you for the FB page for small quilts. 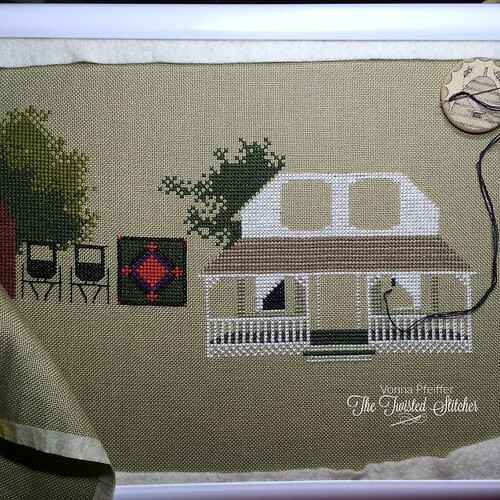 I subscribe to your blog but I don't comment so felt it was time to tell you, "Thank You" for everything you share, your stitching and finishing talents, your family and for welcoming us into your home. 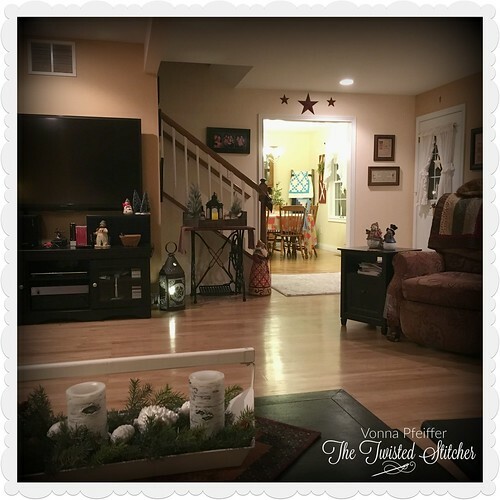 Vonna, it is wonderful getting to read such a relaxed sounding chatty post. The kitchen looks great. Thank you for sharing it with us. I hope you're feeling better soon. I hope you're feeling back to yourself soon. Let the cave wait a few days. You'll recover faster with rest! 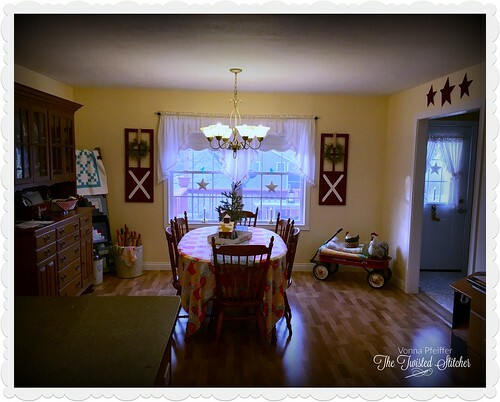 Love seeing your kitchen and dining room refresh! We need to do some of that around here too. There is always something on the list! Happy New Year to you and your family Vonna! Add a nice nap to that schedule!! Take care and get well soon! Sounds like the Virus I have just had , hope you feel better very soon. Your home looks lovely very cosy . Sorry to hear you are sick ! I have the crud too......the cough is horrible and hangs on. Happy New Year ! 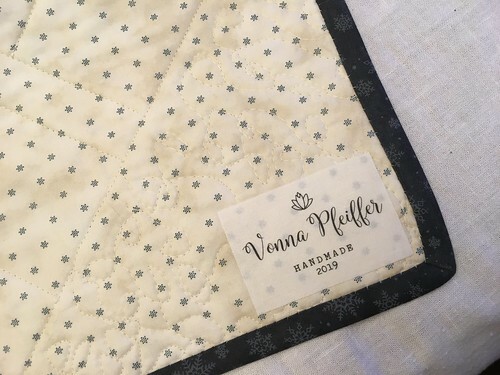 I'm happy you are taking more time for yourself this year with your quilting and stitching. 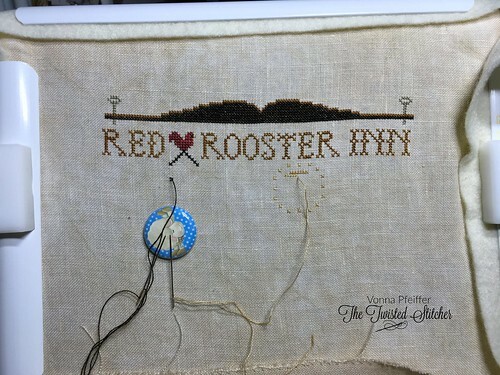 Have fun stitching your older WIP. I totally understand the time lapse. I just finished a large project that I started 8+ years ago. It felt wonderful to have a finish and a beauty too. You home is always decorated so nice. I love seeing the pictures. The new paint makes the kitchen and dining room pop. Very pretty and so inviting. 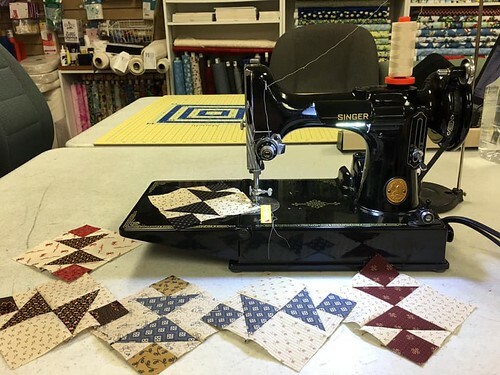 I love seeing your quilting and stitching projects......have fun ! I hope you feel better soon. Take care ! I hope and pray you feel better quickly my dear. I truly enjoyed seeing your lovely home. Please survive the flu!! 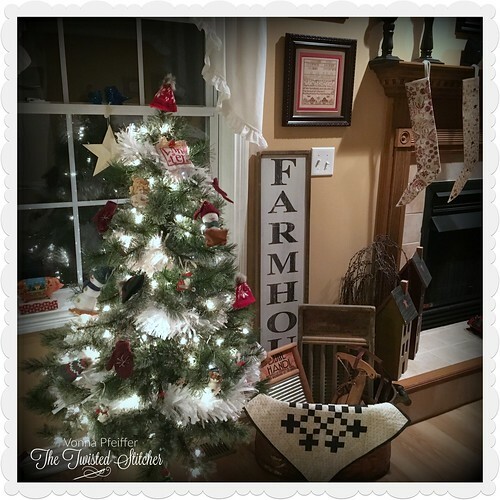 Your posts, Flosstube videos, and needlework finishes are so wonderful and inspiring! I'm so sorry that you're sick. I have been home from work 2.5 days with a nasty cold, but I think I'm past the hump. 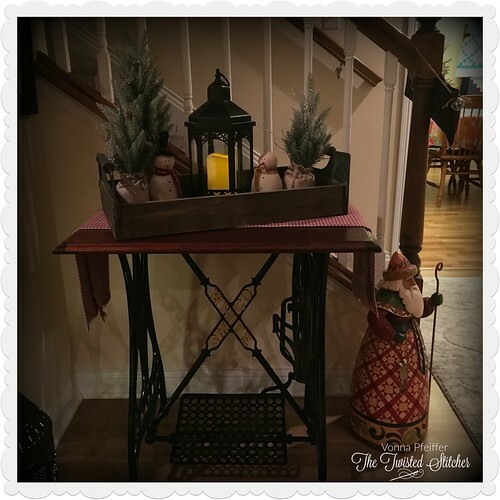 Love the paint color that you used and it is a treat to see your decor. I have 2 TIAG pieces in my den. I know I have a wip that was gifted to me by someone who said she'd never finish it. I might have to go hunt it out! Vonna, hope you are feeling better by this time. I hate those colds that make me grumpy and miserable. Love looking at the pictures of your winter home. Just beautiful. 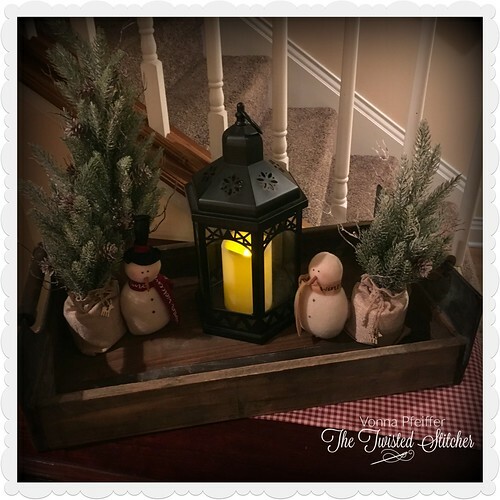 Love the pics of your winter home. Thank you for sharing. Keith did a great paint job. I hope you feel better soon. snowman tree to brighten up the dark days. 21 years is not bad for a wip. I finished a Prairie Schooler one last year that had been in the closet for 24 years. It had the same masking tape stuck to the edges, too. Love your quilts, too. Hope you can get rid of that cold soon.